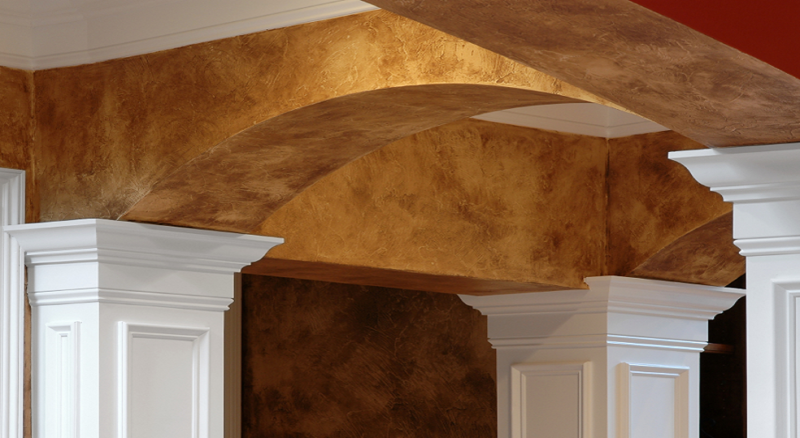 Faux finishes in painting allow the person to create textures or effects that resemble surfaces such as stone, suede, crackled paint, etc., that enhance the appearance of the room. There are hundreds of faux finishes that can be selected from, depending on the design style that you want to achieve in your home. Some of the most popular faux finishes include rag rolling, stippling, and stone finishes. Each of these faux finish techniques can be accomplished with your imagination and just a few materials. For stone faux finishes start by making sure that the surface you are applying the faux finish technique to is clean, dry and free of any debris. It is a good idea to get a picture of the type of stone, (including colors and patterns) that you want in advance so that you have a reference while you work. Next you will need to apply a base coat in an off white color for the foundation of the faux finish . Once this dries, mix together the primary color of your stones, using a latex paint, with two parts of a latex glaze. This faux finish will now need you to use a rag or paper as an applicator to dab on the mixture to create the texture of your “stone”. Then, using cardboard or heavy paper, create a stencil for your “stones” and trace them onto the surface, taking care with placement of the “stone” so that they seem natural to the eye. Finally, your faux finish will need you to follow the lines of the outside of the stones with a natural color paint, creating the appearance of a mortar on the surface. While this faux finish technique may take some time, depending on the area to be covered, the results will create a beautiful faux stone finish that enhances any decor. As with any faux finish technique it is advisable to first practice the technique process on a spare board or surface that can be discarded when you are done. Not only will the practice time make sure that you are comfortable with the real application of the faux finish , it will allow you to make any adjustments in color if necessary before you begin the work.